Mirrors are one of the most under-appreciated elements in interior designs. If you’re looking for simple ways to spruce up your interior, consider how a mirror or two can help. Tricks for Decorating with Mirrors. 1 – Give your room a view. Have a room in your home that lacks a window, or has a window too small to give you any view? Make way for a mirror. 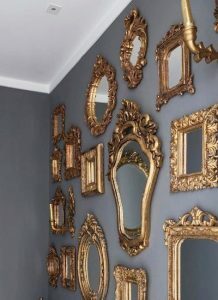 Buy a larger mirror with an attractive frame and hang it on the wall. Consider placing a large potted plant, on the opposite wall so some greenery is reflected. By playing around with the reflection, you can fake out the eyes and enjoy the space without ever noticing the lack of windows. 2 – Let there be light. Depending on available light sources and the angle of your mirrors, a small amount of light can go a long way due to a mirror’s reflective properties. You can brighten up your space with a clever use of light sources and mirrors. Play around with different arrangements to amplify the light factor without suffering the negative effects of a harsh glare. 3 – Make the room larger. Here is one of the best known and utilized mirror tricks – use the reflection to make the room seem larger. This can be done using almost any decent sized mirror. If you’re looking for ways to do it a little differently, try placing a floor-to-ceiling mirror behind a dresser or cabinet. Usually mirrors hang above a furniture piece or are used as a full-length or full-sized mirror. 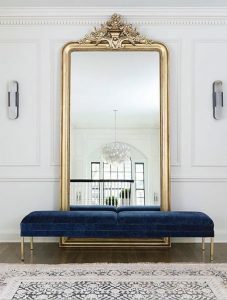 Something special happens when the right sized mirror is placed behind the furniture, making the room feel larger and it also yields a more interesting view. 4 – Decorative mirrors for decoration’s sake. 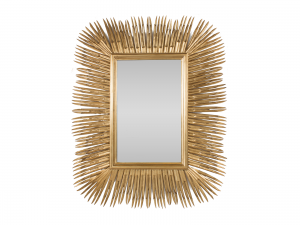 Sometimes, the mirror is just the added bonus in an already decorative piece. Such is the case with a sunburst mirror, which works in just about every type of design, or mirrors with beautiful, got-to-have-them frames. You get the benefit of an art piece combined with the positive effects of using a mirror – so it’s double the visual impact. Every home should have a beautiful mirror. 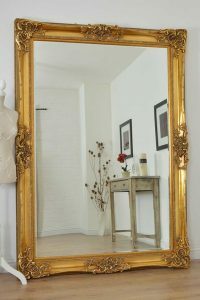 With that in mind take a look at our collection of silver & gold mirrors!